Gaining visitor’s attention is easy but converting them is not everyone’s cup of tea. To make this ordeal simpler we’ve reviewed two fantastic conversion optimization plugins- Icegram and Popup Maker. Note: Both these plugins have free as well as premium features. But for simplicity sake, we’ve concentrated more on what the free versions offer. And the features are mind boggling. 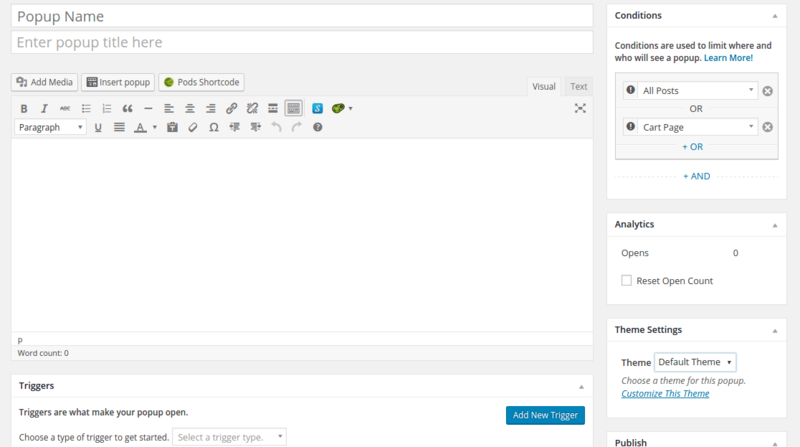 Both Icegram and Popup Maker are available for free on the WordPress repository. You can easily search, install & activate them. Unlike other competitors like Sumo Me and OptinMonster, these plugins don’t force you to sign-up for using any of it’s functionality. Making them crowd favourites. How Many Types Of Optins These Plugins Provide? Today the types of optin used to gain attention is a crucial thing. And Icegram spoils you with loads of choices. These optins are very different from each other and fit almost every niche out there. You can also preview how your optins will look on your website before making it live. Popup Maker on the other hand concentrates more on Popups. Popup Maker says that you can also create sidebars, slide-outs (messenger) but you need to play with code for it. You can have a live preview of your popup when you tweak changes to it. The main purpose website owner use an optin are to grow their email list. The two main components of any a subscriber optin is the email field and the CTA. 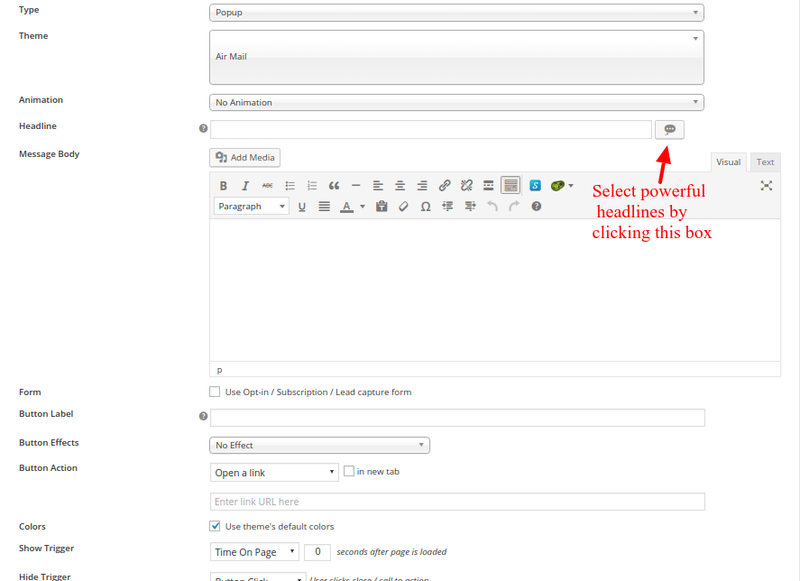 However, only one of the two plugins compared allows you to insert a subscriber form in the free version. In Icegram, you can embed any HTML form to your optins from any contact form plugin for your email marketing work. That too, in the free version. But in Popup Maker, there is no such provision in the free version. You need to purchase their extensions to add a subscription form from any contact form service in popups. You can add different types of form to the popup as per your requirements. Popup Maker is generally “Bring your own Form”. Themes are the backbone of optins. Themes give optins the actual character that make them appear pleasant and grab eyeballs instantly. 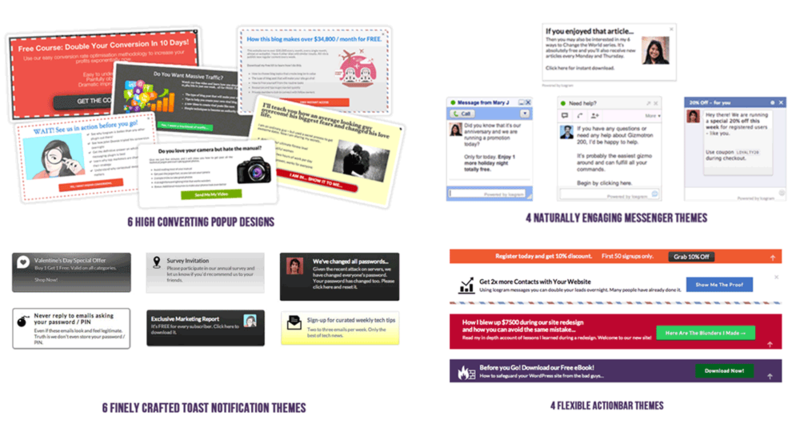 Icegram provides 20 high converting themes in the free version. These themes have excellent designs which can be easily customised to fit the colour scheme of your website. Icegram also has premium theme packs that further increase the number of themes to a whopping 90+. Also, you can easily create custom popup themes. Popup Maker provides 6 simple themes in the free version. You can customise each one of them for colour, fonts, contrast, styles, etc. In this way, you can create many theme combinations. How Many Optin Can You Show In The Free Version? Both Icegram and Popup Maker come with a simple and easy-to-use editing panel. You can add images to your optin as well as change optin size. You can also add your own custom CSS code for your optins. 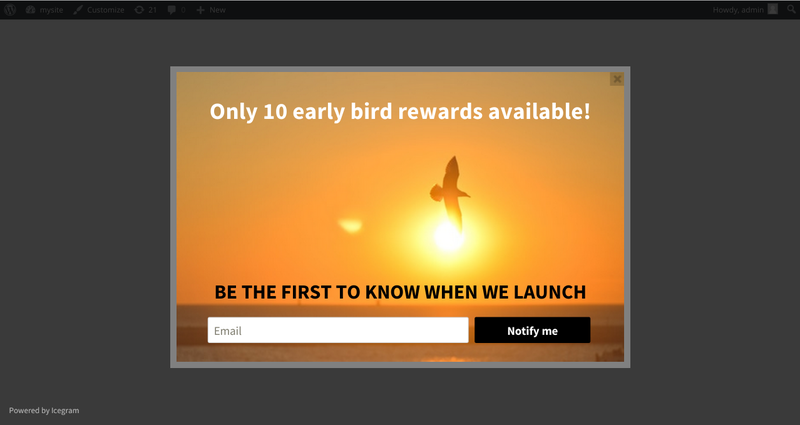 In Popup Maker you need to buy their addon to enable the background image feature. If themes grab attention, powerful headlines convert visitors. In Icegram you can add your own headlines or generate strong headlines from the in-built headline generator. In Popup Maker, you need to create your own headlines. There is no headline generator. Visitors are smart. The old techniques of showing optins right when the visitor lands on the website just doesn’t work. You need to be smarter than them so as to make them convert. Use powerful targeting rules to trigger optins at the right place and right time. Icegram has awesome targeting rules that cover almost every case. The targeting rules are well organized and simple to understand. Icegram also has exit intent trigger for all its 12 optin types. It’s available in the paid plan. Check out Icegram’s pricing. 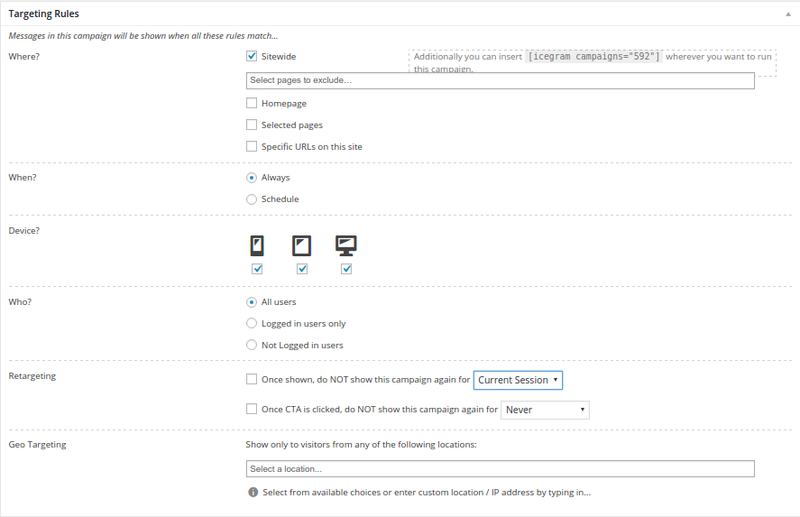 Popup Maker provides limited targeting rules in the free version such as targeting optins on different pages. 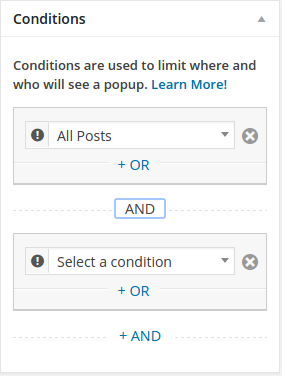 Other rules such as showing on mobile devices, exit intent popup and others are available as a paid addon. If you can measure what messages people are looking and clicking at, you can implement an overall strategy to improve your conversion rates. That’s the reason analytics are of prime importance. Icegram provides conversion and impression analytics as well as click through rate as to check which of the optin is converting better than others. Along with these metrics, you can also see color graphs representing your campaign performance. Analytics is available in Icegram’s paid plan. 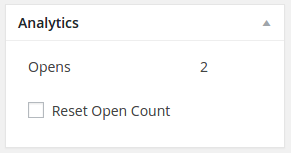 Popup Maker provides only open counts of popups in their analytics. Their conversion and impression analytics is available as a paid feature. Animations act as a supporting feature to the optins. A little bit style to display the optins makes it more attractive. Icegram has option to add beautiful animation effects to it’s optins. Entry animations, exit animations as well as CTA button animations makes your optin very engaging. It’s available in the paid plan. Popup Maker provides animation effects in the free version. If you are looking beyond popups, need subscription forms, CTA and powerful targeting rules that too for free, go with Icegram. Icegram also has more powerful features in it’s paid plans. If you looking for just popups to show visitors without asking for subscriptions, go with Popup Maker. For all other important features like forms, CTA, targeting rules, you need to purchase their individual add-ons or the core bundle. We have been as unbiased as possible. It comes down to you to decide which one is your favourite and why. I’m not seeing that it’s compatible with the new version of wordpress, updates coming soon? Are you referring to Icegram? If yes, the can you point us specific working that is not compatible? If you are referring to Popup Maker so contact their developer.